New Orleans has survived plagues, invasion, hurricanes, and managed to develop into a culture whose roots go far deeper than the Reformation or the settling of Jamestown. But, like everyone else, we lost more than a few of our people along the way. It's how we coped (and continue to do so) that's so extraordinary. Not your ordinary tour, it is designed for the discriminating and curious traveler who seeks to go beyond the humdrum into an understanding of our remarkable culture. Your tailored tour sets out on your schedule with a focus on religion, enslavement, and music have bound together to create what The New York Times has called the “world’s most unique culture!”. The tour originates in an authentic Creole Cottage and visits architecturally-significant and culturally-relevant landmarks as the former Bank of Louisiana, the home of Paul Morphy, America's first Grand Master Chess Champion, and the Irish Cultural Center before leaving the Vieux Carre to explore the Mortuary Chapel, and beyond to the oldest cemetery in New Orleans. 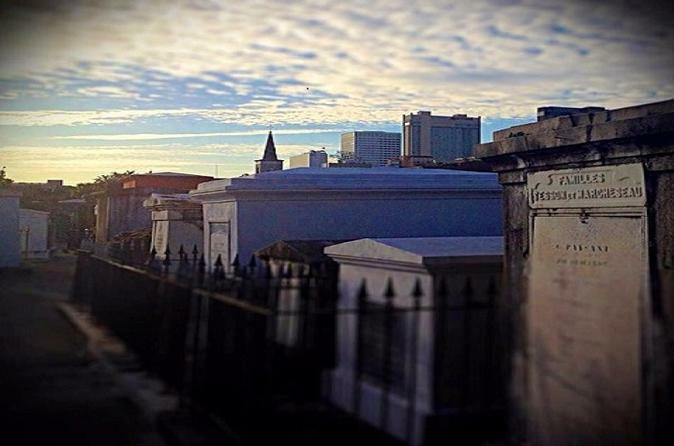 Unveil the secrets of our burial practices and the various types of tombs that make our cemeteries unique in America within the sacred walls of the St. Louis Cemetery. Learn the truth about Marie Laveau, Voodoo, and the mysteries of Congo Square before leaving the beautiful Armstrong Park, home to New Orleans Opera and countless musical festivals. Return through the picturesque French Quarter past Gallier - designed townhouses to the charming Hermes Bar at Antoine's Restaurant, the perfect spot for a casual lunch and a refreshing drink.